Extrusion welding consists of introducing a ribbon of molten resin, a “welded bead”, along the edge of the overlap of two (2) geomembrane sheets to be welded. An extrusion weld is produced by a 4mm or 5mm diameter welding rod manufactured from the same material used to produce the liner. A hot-air preheat and the addition of molten polymer causes some of the material of each sheet to be liquified resulting in a homogeneous bond between the molten weld bead and the surfaces of the overlapped sheets. The extrusion welder is equipped with gauge giving the temperature in the apparatus and numerous settings for the pre-heating unit. The area which is to receive the extrusion bead shall be ground to remove surface contamination and surface tension. The welding rod shall be free from dirt, dust, moisture, and tangles at all times. The machine shall be purged for approximately 30 seconds prior to the actual extrudate welding. The bottom portion of welding die shall stay in intimate contact with the liner and conform to various seam angles and configurations. The welder die shall be kept “on centre” at all times, ensuring that an equal amount of extrudate bead is applied to both portions of liner overlap (top and bottom). 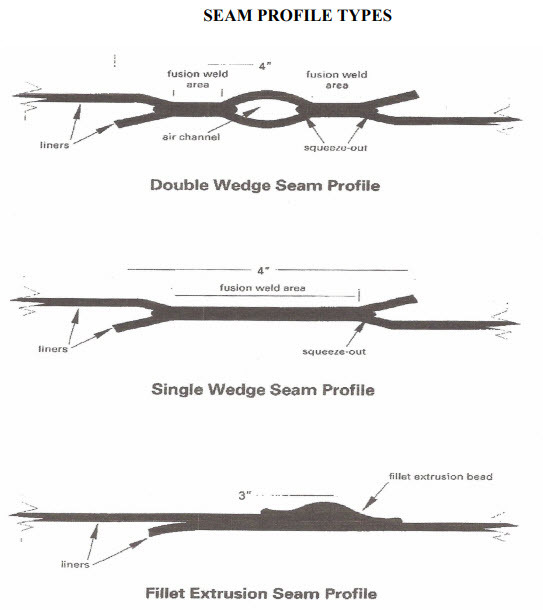 A consistent forward welding speed shall be maintained, to ensure a smooth and uniform extrudate bead. All patches shall have a 1 inch radius at corners, and be securely tacked to the liner.